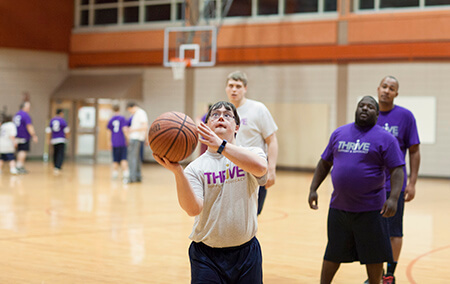 THRIVE SUPPORT & ADVOCACY EMPOWERS YOUTH AND ADULTS WITH DEVELOPMENTAL DISABILITIES, AND THEIR FAMILIES, TO LEAD RICH, ACTIVE AND SELF-DIRECTED LIVES. Thrive celebrates and nurtures the abilities of people with developmental disabilities in Metrowest, Central Massachusetts, and beyond. Our organization provides the space, support, and resources to help individuals and families thrive. We believe we should all be defined by our greatest strengths instead of our most obvious weaknesses. Disability does not define our participants. We choose to focus on ability by creating opportunities to redefine success and re-frame potential in terms of what our participants believe they can do, instead of what they’ve often been told they cannot. We choose to see gifts before challenges and work to achieve bright moments in the lives of the individuals and families we serve. We know that when we realize our own greatness, we thrive!